Melissa Lucarelli had a meltdown when she learned on Wednesday that her ‘husband’ Dino Hira had secretly recorded her phone conversation with her sister. 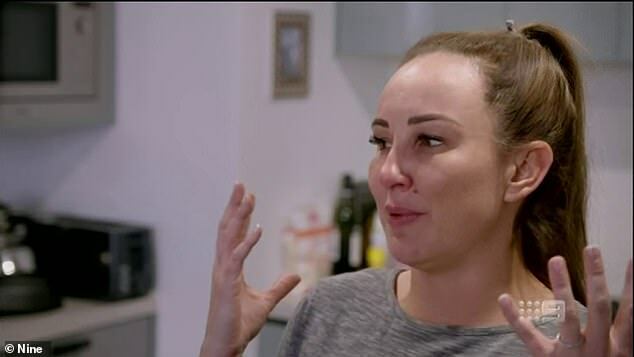 And a criminal lawyer has now weighed in on the legality of the Married At First Sight star’s actions, which Melissa furiously insisted had broken her ‘trust and respect’. ‘Under the Invasion Of Privacy Act of 1971, people are afforded a certain level of privacy,’ Nick Dore, of Fisher Dore Lawyers, told Hit 105’s Stav, Abby and Matt. ‘Technically, if you’re having a private conversation with another person, anyone of that party could record the conversation,’ he went on. Nick drew this out in layman’s terms, explaining that if he was in a private room like a closed office he could expect privacy, but somewhere more public like a busy cafe would be different. ‘If I’m having a conversation with someone and I shut the door and someone puts a listening device to the door and records it, that would be a breach of privacy,’ Nick said. ‘However, if I’m on the phone sitting in a coffee shop and someone overhears and records it, there may be an argument that you weren’t affording yourself privacy,’ he added. Dino was in bed while Melissa was talking to her sister in the other room. The lawyer suggested that because Melissa didn’t outline expressly that it was a private conversation – by closing the door for example – Dino’s actions may not count as a breach of of privacy. Recalling his behaviour, Dino told producers on Wednesday: ‘When I was in bed last night, I overheard Melissa saying some unkind things to her sister in a phone conversation. But when he admitted to Melissa that he not only heard her conversation, but recorded it, the 38-year-old talent agent was left enraged. ‘I actually feel sick about it! You have violated my trust and my respect. What you did was sneaky and calculated. I have no trust for you!’ she fumed. ‘I am so done!’ When Dino admitted to Melissa that he not only heard her conversation, but recorded it, the 38-year-old talent agent was left enraged. ‘I feel betrayed by him doing that, he listened to my conversation and pretended to be asleep,’ she added. During the dinner party, she broke down in tears after confronting her TV husband about secretly recording her. ‘I’m so done. I am so done. I am so sick of this!’ the upset blonde said to Dino while sobbing uncontrollably. Wiping tears from her face, Melissa said she was ‘so done’ as she stormed out of the party and did not return.